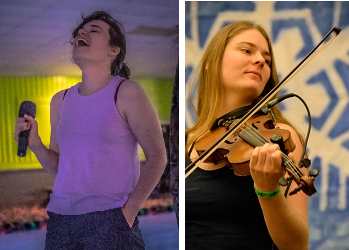 Contra dance for all! After an intro (or not if you missed it! ), come join us for a slightly more challenging version of contra! Still accessible to new folks, these selections from the American dance form will be more like what you would see if you attended one of the many local dances in the Bay area. Alexandra Deis-Lauby is a NYC-based caller, dancer and organizer. She is happy to call to crowds of experienced dancers, new dancers and everything in between! She calls local dances, weekends and festivals all over the country. When she is not calling she can be found on the dance floor. Audrey Knuth is a classically trained violinist with B.A. in Music Production and Engineering at Berklee College of Music in Boston. While in New England for school, Audrey explored other musical genres and made a name for herself primarily as a world folk musician. Having recently moved to the Bay area, Audrey continues to tour the US in several bands (Wake Up Robin, The Gaslight Tinkers, Free Raisins) and spends the summers teaching at several dance and music camps.